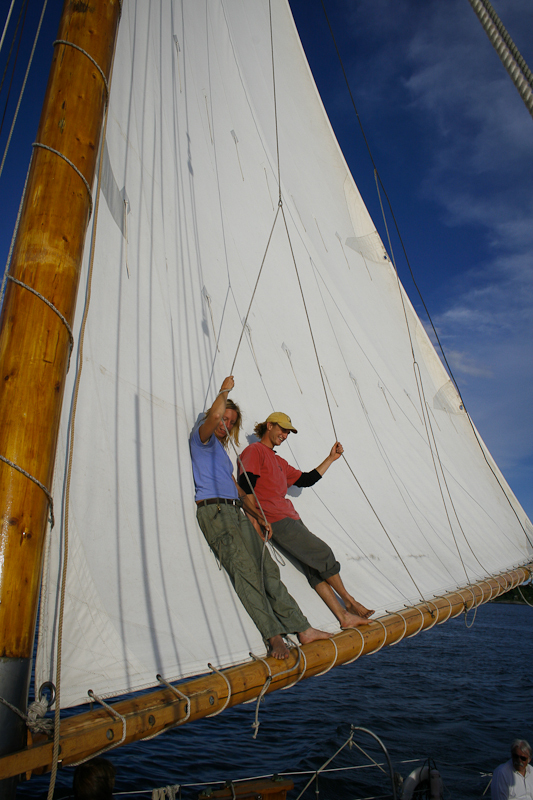 One of the best ways to explore Maine’s maritime history is aboard one of the schooners that used to ply these waters before steam and diesel ships took over. 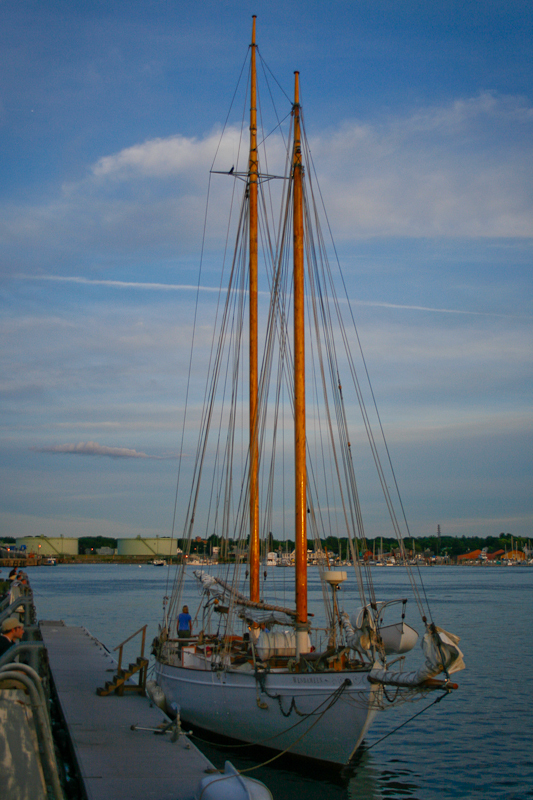 I board Portland Schooner Company’s 88-foot, two-masted Wendameen moored on Portland’s Maine State Pier for the sunset cruise. The Wendameen is an interactive piece of Maine history. 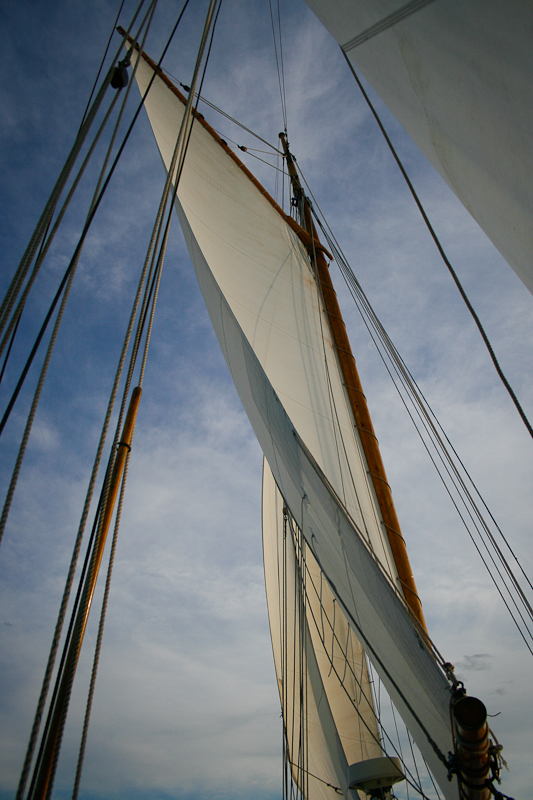 Built in East Boothbay, Maine, Wendameen was launched in 1912, where she was the vanguard of the sleek, fast ocean-going schooner fleet. She is now listed on the National Register of Historic Places. The crew invite us to participate in the casting off duties. 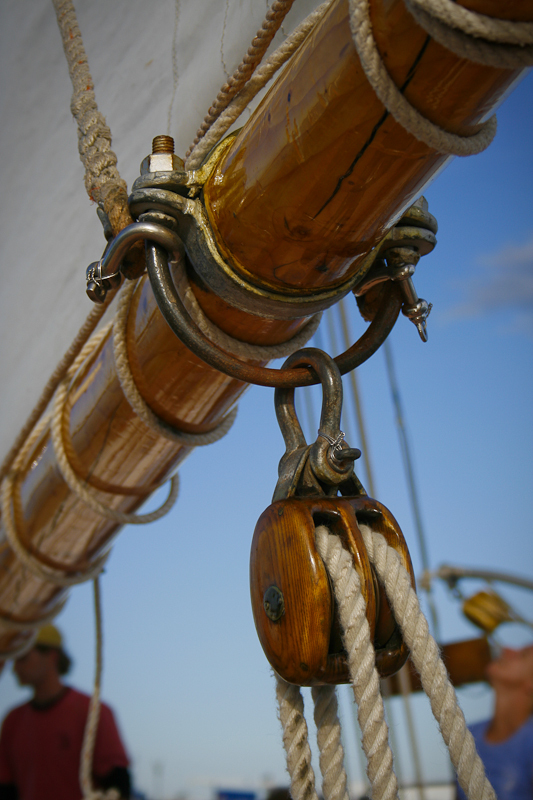 Hands pull hard against ropes, worn smooth from use, as we raise the sails and help tie off the rigging. It becomes quickly apparent that sailing can be both a lot of work and, as the traditional work shanties are demonstrated, a lot of fun. Wendameen was meticulously restored in the late 1980’s and it shows in the details. The woodworking glows in the evening light. The ship feels solid as she glides along Casco Bay toward Peaks Island before turning down-wind and racing toward the white spire of Portland Head Light. 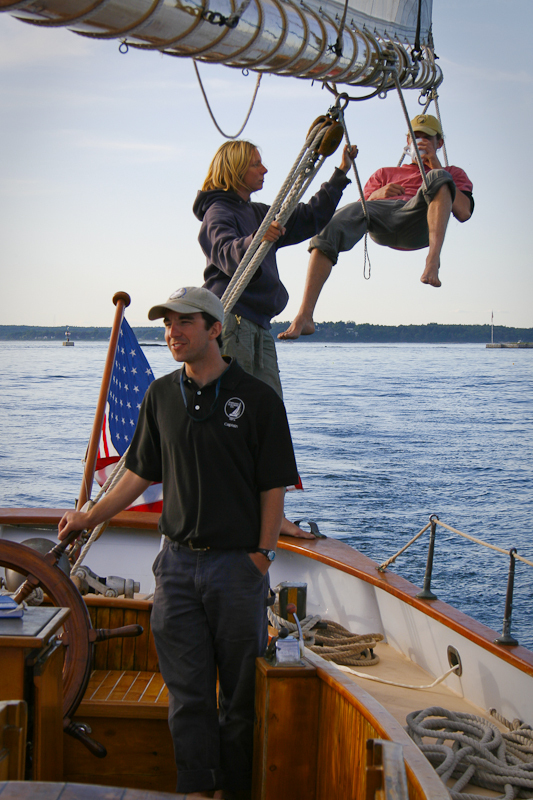 The Captain and crew play a big part in the joy we experience on the water. They love sailing and seem to love hanging out with a bunch of tourists, teaching them the art of what they do. 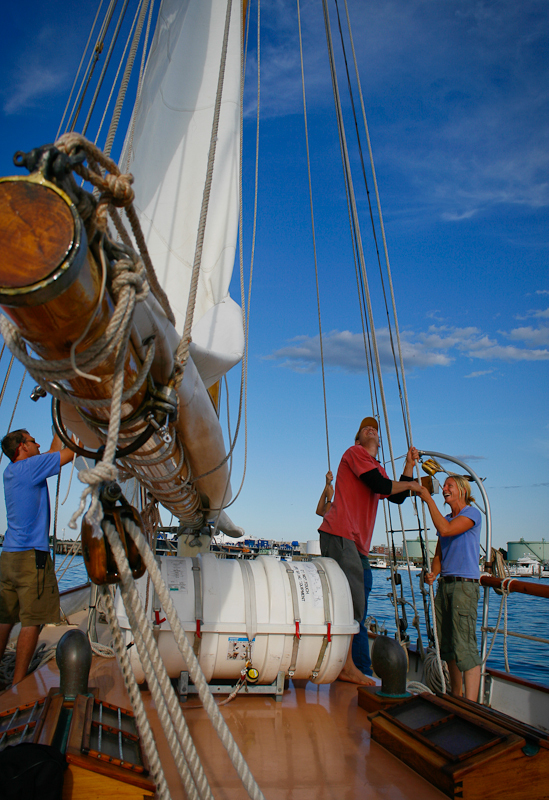 They also demonstrate all the ways sailers lounge on the rigging. On long voyages, there is a lot of down-time. Evidently, knowing how to relax is a key skill. 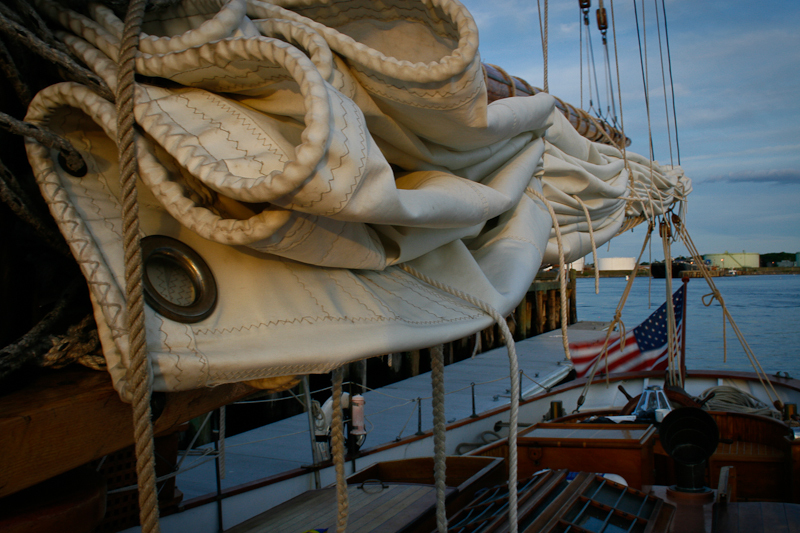 The sails creak as the wind fills them and they pull against the ropes. Even in the light breeze we encounter, the sails generate plenty of power. The ship sways with the slightest wind and accelerates easily, illustrating one of the ways one can travel without burning fuel. We sail back to port as the sun touches the horizon, lighting up the Time and Temperature Building, a much used landmark on Portland’s skyline. 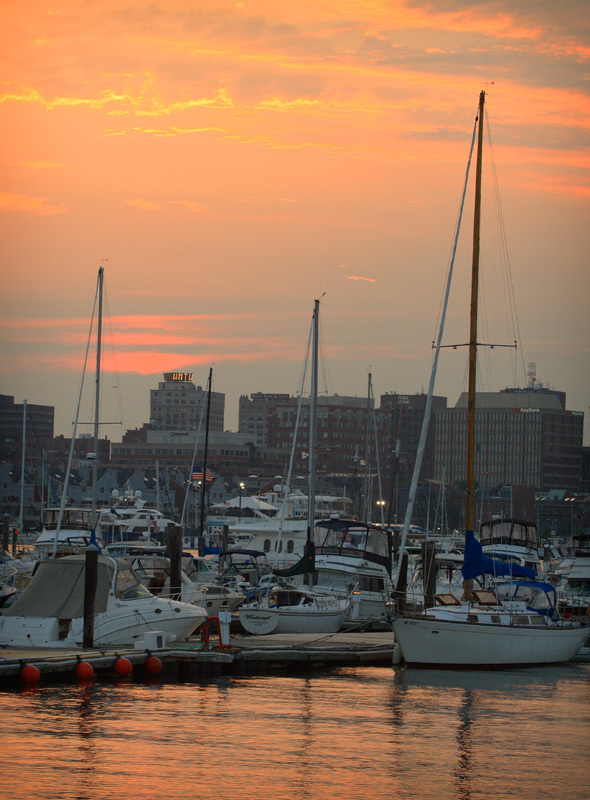 Back at the dock, the thick canvas rustles as the sails are lowered, tied off and stowed. The crew coil the ropes in tight spirals. They pull the ship snug against the dock. Everyone walks down the gangway, thanking the crew. I stay a few moments longer, enjoying the movement of the ocean beneath my feet. Finally, as the last rays of sun disappear, I join the others on the pier, looking back the simple machine made of wood and rope and canvas.